Before you continue reading the rest of this post, I would like you to take a moment to think about a few things. Keep these in mind, and you will have a better feel for your current website, and where it could use some improvement. Why do you have a website? What motivated you to purchase or create it? What is your website doing? What impact does it have on your business? Most businesses, including home inspectors, have a website. They’re expected to. You often hear how important it is to have an online presence. Yet it is not the presence itself that’s important. What is important is what you can do with it. Your website plays a critical role as the first, and possibly only, interaction you’ll have with potential clients. Sure, a lot of your work might come from referral sources, but many prospective clients will still check your website to compare against your competitors. Keep in mind that a website is a tool. It is only useful if you use it. In order to be useful, the tool must be designed for a specific purpose. In practice, most websites are multi-purpose tools, designed to accomplish multiple tasks. A website that is purposefully designed, strategically thought-out, well developed, and expertly written can help your business in several ways. Today, we’re going to cover six of them. Every one of us makes assumptions based on first impressions, even when we know we shouldn’t. It’s in our nature. With websites, the first decision we make is whether or not to stick around — based purely on first impressions. People decide, often subconsciously, whether or not to hit the back button in a matter of seconds. Some people say it’s 3 seconds, some say it’s 5 or 7. The exact number isn’t important, but the concept is. 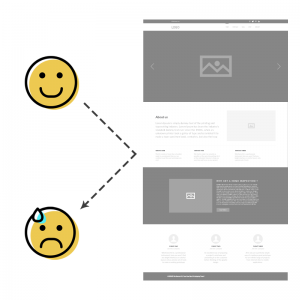 The perceived load time of your website can have a major impact on your first impression. If it takes more than a few seconds, you may not even get the chance to make one. Slow loading and poor performance cause frustration. That is not the first feeling you want people to have towards your company. The immediate visual experience will have the most profound affect on your first impressions. A well-designed website with good color choices, tasteful images, and plenty of space creates a sense of professionalism. Clutter and intense, over-saturated colors provoke an immediate rejection response — something you’ll have to work that much harder to overcome. A cluttered website suffers because people don’t know what to do or where to look. They’re faced with too much visual information and too many choices. Too much content on a page, or a wall of text, is simply intimidating. Either of these issues can cause people to turn and immediately run to the next inspector. The content on your website should be focused on your potential clients. They are only interested in how your services and experience will benefit them. If you choose to focus on yourself — or your family, your dog, the paper route you had in high school — then you’ll give the impression that you don’t care about them. That perception damages your image and bolsters the competition. Auto-playing media almost always backfires. Typically it’s too loud, startling or embarrassing the other person. They’ll leave in a panic, and won’t be coming back. You’ll definitely get more views this way, but it isn’t worth the damage you inflict to your own brand. Also, keep in mind that music is subjective. 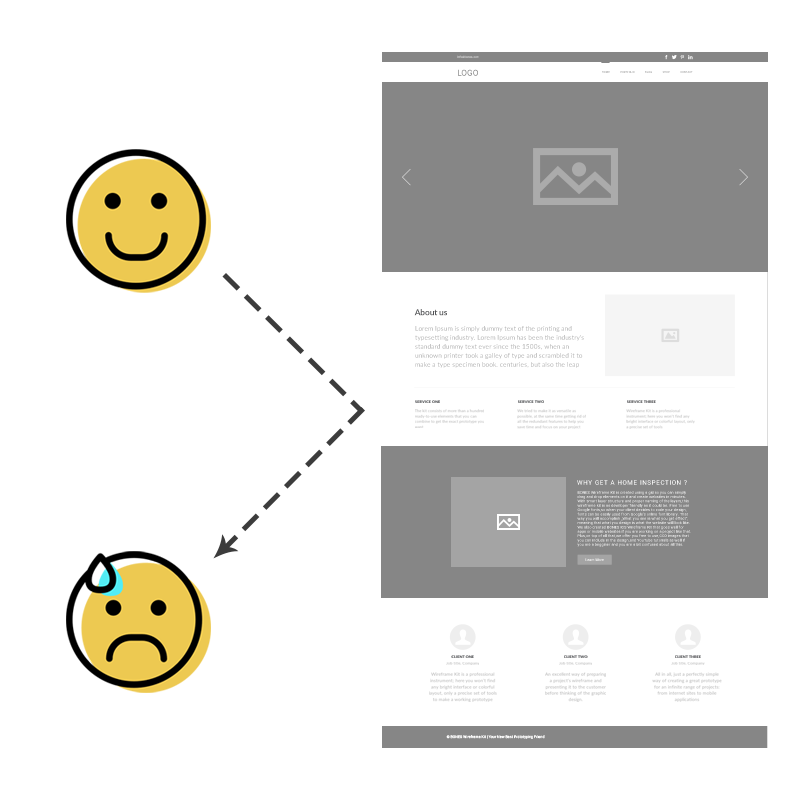 Differing tastes could make your website a turnoff for some visitors. First impressions establish a mental image of you and your business in the minds of potential clients — for better or for worse. The impression you make in the first seven seconds is going to have a huge impact on whether they hire you or move on to the next inspector. A damaging first impression is going to require a lot of work to fix. All businesses have a brand, either by design or by accident. If your brand is strong enough, it can help you increase recognition, improve trust, empower advertising, and ultimately acquire new business. That brand will be affected by your website. The question is: Will your website strengthen your brand, or weaken it? A successful brand is built on a core set of values, interwoven into every aspect of the business. Each piece, from the logo to the way you interact with your clients, builds on and reinforces every other piece. Elements of your business that are inconsistent with the values of your brand are like weak links. A website that is consistent with your brand will strengthen it, otherwise, it will be diluted. A logo that is consistent across every aspect of your business will give people something to attach their experiences to. If you have a different logo in different contexts, or no logo at all, then you lose that emotional anchor — severely weakening your brand. Another way your website can help your home inspection business is by building rapport with the client before they’ve even been able to speak to you. You can let your personality show through with the language you use in your website’s content. Present yourself as professional, friendly, funny, serious, or whatever you want. Just be sure that the personality reflected on your website is genuine and adds value to your brand. Most clients aren’t going to be able to meet you before they hire you. However, with the right approach, potential clients can leave your website feeling like they already know you. A well-done video with you speaking directly to the client can be especially useful to achieve that level of familiarity. Another objective your website should help you achieve, in the long run, is establishing yourself as an authority on home inspections in your area. You can gradually build up your authority by consistently sharing your knowledge and experience to help buyers, sellers, and real estate agents. Share with them the problems and risks involved in buying a home as well as some of the techniques, processes, and technologies you use on the job. The most effective way of building authority with your website is via a regularly updated blog. Keep in mind that in order to build that reputation, your motivations need to be in the right place. A blog that exists purely to increase SEO and bring in more traffic won’t have the same effect. You are your website in the mind of someone who has never met you. The impression your website leaves is their impression of you as a home inspector. The same goes for your competitors. You can use superior design, language, information, and character to position yourself above your competition in the minds of potential clients. The ultimate benefit of any marketing platform is more business. It’s the reward for proper execution, for doing everything else right. A well-designed website, in visuals and content, is a very cost-effective method for gaining new clients. Unless you’re spending several thousands of dollars, it’s an easy investment to make a return on. For example, our websites pay for themselves after only 1-2 inspections each year. An effective website also opens up additional opportunities for more business, such as organic search traffic (SEO), paid search traffic (SEM), social media, and more. Quick Note: Due to how the home inspection industry works, most buyers receiving referrals from their real estate agent, search traffic tends to be quite low. For this reason, I do not recommend focusing on SEO and SEM marketing in most situations. The home inspection industry has traditionally relied on marketing to real estate offices and directory listings to grow. However, with more tech- and marketing-savvy generations entering the housing market, I believe that process is going to become much more difficult without an effective website to support it. As buyers and sellers are doing their own research, you need to be sure that your website effectively represents you and your company, and puts you in a good position to earn their business. Even in an industry driven primarily through referrals, your website can be a valuable asset to your company — if it’s done well.